When Judge James R. Ross and I were laying out the event schedule for the family reunion, I asked Judge Ross if he would speak about his childhood and growing up in the household of Jesse Edwards James Jr. as his de facto father. In all the time we spent together, I always was most intrigued by those stories he related to me privately. I thought his family would find them of interest, too. 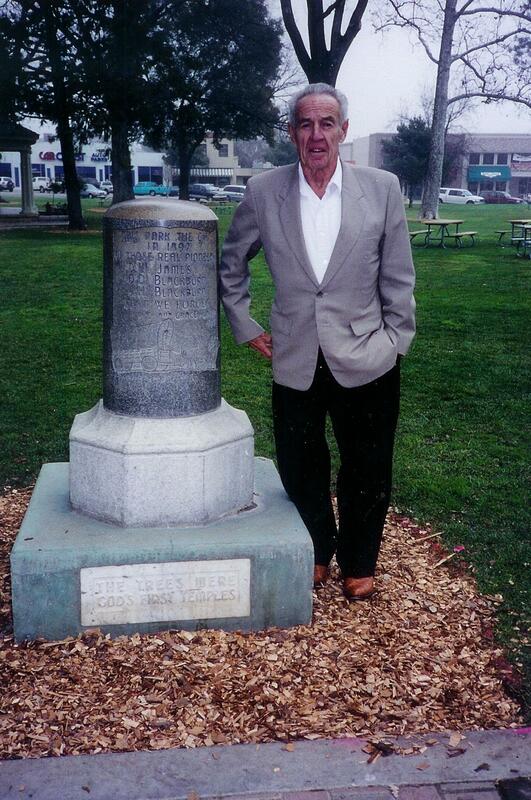 Judge James R. Ross beside the historical monument that commemorates his cousin, Drury Woodson James, founder of Paso Robles California. The memorial stands in the park D.W. James donated to the city. What I didn’t realize was that his agreement to discuss the subject meant he intended to use the topic as an opportunity to sell his book. 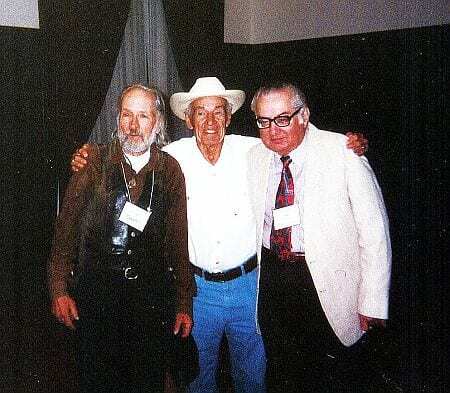 In the mind of Judge Ross, he had written his book I, Jesse James specifically for that reason, to tell people the stories he had heard about Jesse James while growing up in the household of the outlaw’s son. The talk Judge Ross delivered was not the leisurely reminiscence I thought he would present. Instead, what he delivered was a short promotion for his book. What was really on his mind, though, was a deal to make a movie from his book. What he said on that in his talk he had kept close to his vest. I had no idea beforehand of the option contract for a movie that he just had signed. Judge Ross intended to surprise us all. Sadly, TNT never did make a movie of Judge Ross’ book. The Judge’s lifelong ambition to make the only movie about Jesse James that was factual and true went unfulfilled in his lifetime.